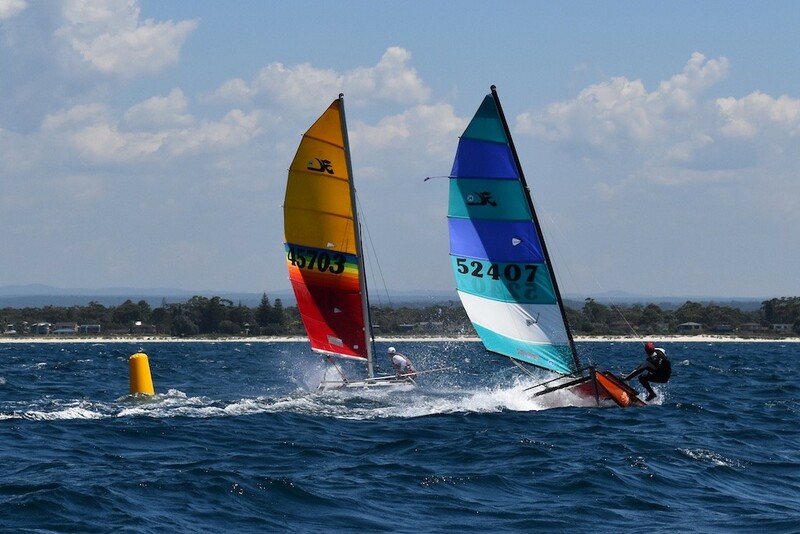 The first day of the Hobie 14 Nationals and Jervis Bay Classic was as good as it gets. A Fleet of 18 Hobie 14s, 7 Hobie 16 Youth teams and 10 open H16s enjoyed (or endured) a Jervis Bay Nor-Easter that built quickly from around 12 knots at the start of race 1, through to a solid 20 with gusts in the mid to high 20s in the fourth and final race for the day. The strong wind an blue sky provided many great photos. The H14 fleet is a tight tussle with Fletcher Warren-Myers and Brad Sumner tied for first, and Georgia Warren-Myers just 2 points ahead of Gordon McGillivray. The H16 open is a McKenzie family benefit at the front with Andrew and Helen leading, closely followed by Upu and Amanda McKenzie, and in third Pat Eastment and Georgii McKenzie. The heavy conditions suited Will McKenzie and Pat Butler and it showed in the set of “1”s on the score card, 2nd is Tait Fortier and 12 year old crew Saxon Perry, who handled the conditions well. Not only was it great to see so many women and girls on the water today, but the number of young Hobie sailors proving themselves in conditions that challenged some very seasoned sailors. Notably Hayley Fisher – age 9, crewing in her first races and loving sailing with her Dad Dave. Young Noah Skewes, also 9, is sailing in his first ever regatta, and was all smiles and full of confidence in his skipper Jeremy Lawson. As mentioned above, 12 year old Saxon Perry is no longer happy to just be out there, but is now striving for good results too. The forecast for day 2 is in stark contrast, with light (under 10 knots) variable breeze forecast – this could shake up the results in all classes.